Label Solutions is dedicated to staying in compliance with the Global Harmonization System (GHS) that is being adopted by OSHA under HazCom 2012 as part of workers right to know. 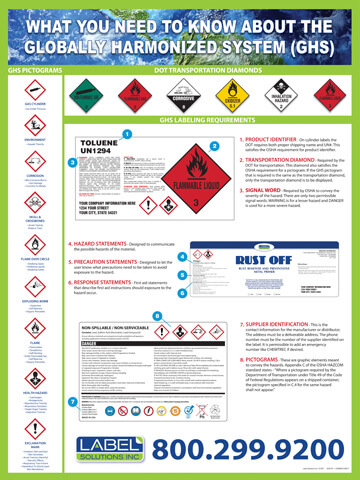 GHS is a common and coherent approach to classifying chemicals (in our industry, compressed gases) and communicating hazard information on labels and the new Safety Data Sheets (SDS). This new system will not only require additional safety information, but it will also standardize the information through the use of signal words, pictograms and hazard statements that are more easily recognizable and understood by a variety of users, regardless of location or language. To help you have a better understanding of the GHS, we have created these free downloads. These guides give you a better understanding of what the new GHS-approved labels look like, along with what the new pictogram warnings mean. As North America’s largest producer of cylinder and cryogenic labels, we are dedicated to helping you with the transition to GHS. OSHA has hired at least 400 new inspectors for enforcement of this provision. Failure to comply could carry a hefty fine. OSHA has been more aggressive in issuing repeat citations with fines up to $12,000 per violation. Each improperly labeled cylinder equals one violation, so the fines can add up quickly. View OSHA's Enforcement Guide on their website. As part of GHS, the format for Safety Data Sheets (SDS) is also changing. A specific format must now be followed. This format mandates you add specific information. If the SDS is not filled out correctly, fines could add up very quickly, on top of being fined for improperly labeled products. While there will be some initial cost to making these changes, they are minimal compared to the fines that could incur because of non-compliance. Label Solutions can help with all compliance aspects of GHS. We have an on-site, professionally trained Regulatory Specialist to assist in proper pictogram and language on your labels and SDS. Our trained specialist has a comprehensive understanding of the new regulations and is here to assist you with your questions or concerns. To learn more, give us a call at 1-800-299-9200 or contact us online. GHS stands for a Globally Harmonized System. Endorsed by the United Nations, it is a system intended to upgrade and simplify hazard communication worldwide. To provide information to users or handlers of chemicals to minimize the possibility of adverse effects. To ensure, to the best possible degree, harmonization among countries. When do I need to comply with GHS? GHS is being phased in over a period of time. All employees must be trained on how to read the GHS labeling and Safety Data Sheets (SDS) by December 1, 2013. All new labeling and SDS will need to be in place by June 1, 2015.
Who is responsible for implementing GHS? As an employer, you are ultimately responsible for making sure all of your workplace labeling and SDS are in place, and for making sure your employees are trained on reading and understanding the new elements of the labeling and SDS. GHS has established criteria for classifying chemicals based on the products ability to cause adverse effects. It has established a system of pictograms, signal words, and hazard statements to be used to communicate the hazards to anyone handling the material. OSHA defines a pictogram as a symbol or graphic element, such as a border, background pattern or color that is intended to convey specific information. Within GHS, these are diamond shaped symbols with a red border and black image in the center. There are nine pictograms within GHS. A signal word is a word used to indicate the relative level of severity of the hazard of a product. GHS uses DANGER to indicate high hazard and the word WARNING to indicate a lower level of hazard. A hazard statement is a statement assigned to a hazard class and category that describes the nature of the hazard(s). Including, where appropriate, the degree of hazard. Everyone in your facility must be trained on how to understand the new Globally Harmonized System. All new standards must be in place in the workplace by June 1, 2015. It is important that workers understand the pictograms and hazard statements; along with how those hazard statements can affect their personal health and safety. Workers must know the proper precautions to take to protect their personal health and safety. Workers must be trained on how to read the Safety Data Sheets (SDS) for additional information. What types of chemicals do you handle?